Janmashtami 2018: Pick up these books around Krishna for kids! On the occasion of Janmashtami 2018, here are some books on Krishna that independent readers can be introduced to. Janmashtami 2018: We’ve put together a list of interesting books that narrate stories of Krishna, which your kids are sure to enjoy. Penned by popular author Devdutt Pattanaik, this book narrates the story of Krishna, who wasn’t allowed to board an airplane because he didn’t have an identity card. His friends Garuda and Sesha took him to meet Lata-kumari in Guwahati, who told him why Rishi Chavan ruled that all gods should carry a ‘dhvaja’ or flag with each god’s very own symbol. This book takes the epic battle within the Gita and transports it inside the body of a young boy called Dev. A classic story delving into the concepts of good and evil, readers connect with some of the deeper concepts in the Gita. This trilogy comprises three parts, namely Amma Tell Me About Krishna!, Amma Tell Me How Krishna Fought the Demons, and Amma Tell Me How Krishna Defeated Kansa! The trilogy begins with the birth of Krishna and his escape from the prison, followed by how he fought the demons Putana, Trinavarta, Vatasura and Bakasura. The trilogy ends with Kansa trying to kill Krishna, who finally defeats him. This graphic novel by Shweta Taneja revolves around Lord Vishnu who comes to the Earth in his eighth avatar as Krishna, the defender of dharma. What follows are stories of Krishna fighting evil to put mankind on the path of righteousness. This book is a one-of-a-kind retelling of the epic conversation between Pandava prince Arjuna and his mentor and friend Krishna that wraps the lessons of Gita in an appealing manner for children. It is thought-provoking and yet brimming with fun trivia. 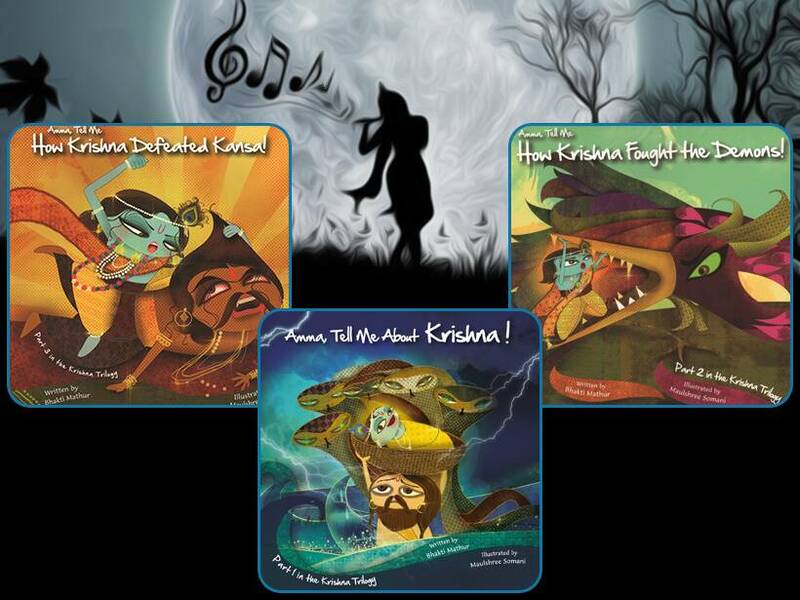 This series includes well-illustrated stories about Krishna’s childhood. The language is lucid and connects with the reader easily.